It is made from fresh Spruce shoots, harvested in spring whilst the needles & twigs are still light green & soft.Only freshly picked spruce sprouts are used to make Bronchosan. 5 ml (6.95 g) of oral liquid contains 1,445 mg of extract (as soft extract) from fresh Picea abies (L.) Karsten (spruce) shoots (0.9 – 1.2:1). The other ingredients used for the liquid are raw cane sugar, honey,concentrated pear juice & pine oil. 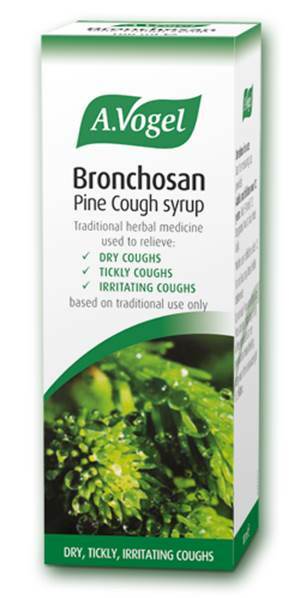 A.Vogel Bronchosan Pine Cough syrup contains sugars (5.25g of carbohydrateper5ml dose). Take 5-10ml (1-2 teaspoons) two to four times a day. Don’t take more than the recommended dose.